I realize that basically every other recipe that I've posted recently has been from the new Barefoot Contessa cookbook. But I can't help it. I went on a little bit of an Ina-binge right after I bought it. This salmon was specifically one of the recipes that drew me in. 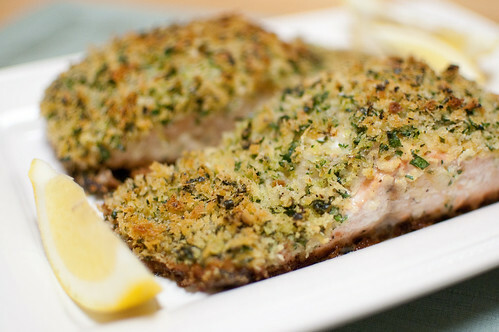 I love love love salmon, and really - how can you go wrong with a panko crust? The night I made this, we were all late getting home from our various jobs/outings/errands, and while I was tempted to stop for take-out on my way home, the knowledge that I had Coho salmon and panko to eat was reason enough to forge on. This was really really easy. Mix together the panko, lemon zest, olive oil, and parsley, then brush the salmon with Dijon, and pat the panko mixture on top. The Dijon acts as a "glue" of sorts, to hold the panko topping on. The salmon is first seared in a skillet, then finished in the oven. I served this with roasted green beans, and we had a fast, delicious, and relatively healthy dinner on the table in under 30 minutes. In a small bowl, combine the panko, parsley, lemon zest, 1/2 teaspoon salt, 1/2 teaspoon pepper, and 2 Tablespoons of the olive oil. Stir until the crumbs are evenly coated, and set aside. Place the salmon fillets skin-side down on a board. Brush the tops with the Dijon mustard, then season with salt and pepper. Press the panko mixture thickly on top of each fillet. Heat 1 Tablespoon of olive oil in an ovenproof skillet over medium-high heat. Wait for the oil to be very hot, then gently add the salmon fillets, skin-side down, and sear for 3-4 minutes, without turning. Transfer the pan to the oven for 5 to 7 minutes, until the salmon is almost cooked through, and the panko has browned. You may need to turn on the broiler for the last minute or two to brown the panko. Remove from the oven and loosely cover with foil. Allow to rest for 5 to 10 minutes. Serve with lemon wedges. what a great, simple recipe! i am a huge fan of panko - they are the only breadcrumbs i ever use! Mmm I bet this is really refreshing with the lemon zest and parsley in the breadcrumbs. You make so many good salmon recipes, it makes me want to branch out into more seafood! Salmon is my absolute favorite fish. And so I have this recipe flagged in the book. Now that I see how great it turned out for you, I will be making it before the week is out. That sounds delicious! Always love new ways to cook up salmon! Now I have to check out that book too! Unfortunately, I am the only person in my family that likes salmon. But, this looks so good and easily adaptable to one serving! This looks delish. I'm trying to eat more salmon, and I wish I liked cooking with the skin on more, but sadly I don't. Dying to see the book, my boyfriend's mother ordered our copies and I told her to hang on to it until Thanksgiving. Sort of wishing I'd let her ship it to me! Sarah, don't worry, I don't eat the skin either. Don't let that stop you - this salmon is all about the panko topping! I'm a massive Ina fan and also have been turning to the new book as much as possible. I came across your blog when googling for a copy of the recipe to pass along to my dad who loved it when I made it for him and my mum last weekend. I live on the West Coast (Vancouver) so salmon is swimming in my blood. We eat a lot of salmon so I'm always happy to have great new recipes to add to my repertoire and Ina never disappoints (as you know). Happy cooking! Love your blog.